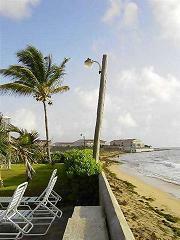 This villa is located at Sealofts On The Beach adjacent to the Marriott resort and across the street from the Royal St Kitts Golf Course. 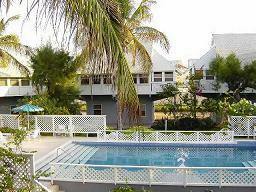 The villa is newly re-modeled and overlooks the swimming pool. This "home away from home" has just about everything your heart desires - all you need is your swimwear. 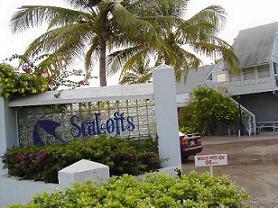 Come experience paradise at Sealofts On The Beach! The villa is located in the heart of Frigate Bay, a tourist area known for its fine dining, beautiful beaches, casinos and golf course. Best of all - while all these amenities are close, you don't hear them at Sealofts. All you hear is the wind and the sea. Bedrooms are air-conditioned with ceiling fans as well. 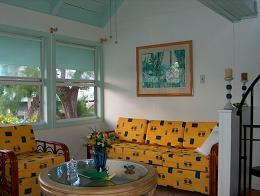 During the evening hours you may prefer to enjoy the wonderful Caribbean breeze. 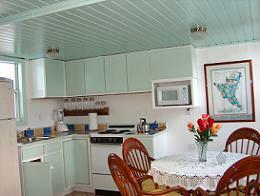 Kitchen is fully equipped with blender, coffee maker, microwave, toaster, dinnerware, etc. One bedroom has its own private deck, while the other extends from the living room. Amenities include 2 tennis courts, gazebos, barbecue area, lush tropical gardens and direct access to the beach with beach chairs. Condo/villa is equipped with in-unit study complete with fax machine, computer with high speed internet access, telephones. You may also wish to take a catamaran cruise or ferry ride to Nevis, enjoy the scenery of this beautiful island on the scenic railway or visit Brimstone Hill ( a world heritage site).